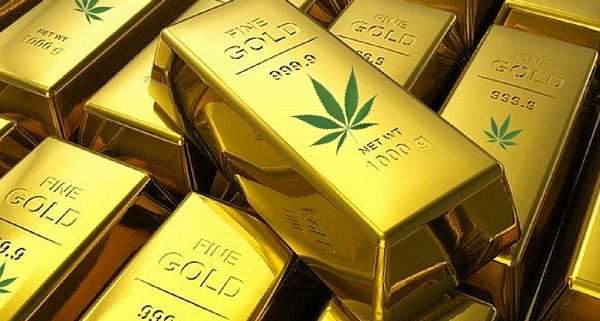 The “Green rush” is the way in which the media has described the incredible “bull-run” which has characterized the equities engaging in the cannabis sector. In this article we are going to analyze the industry, explaining its history, characteristics and main players. We are going to focus in the later part of the article on the Canadian market and the “Big 3”: the 3 biggest publicly traded companies in the marijuana sector. When analyzing a sector in which publicly traded companies are active, a benchmark must be chosen to show how prices of stocks have reacted to the different conditions and events which have occurred. While there were other options, such as using the Horizon Marijuana Etf, provided by Morningstar, or the cannabis price index, provided by the homonymous site, issues of availability and composition ultimately made us choose as a benchmark Canopy Growth Corp. (one of the “Big 3” firms in Canada, which we will analyze later) stock price. It has a very high correlation with competitors, especially during “bull runs”. Correlation can reach up to 0.9 and a minimum value of 0.6 when compared to the other “Big 3”. The first important event which occurred in the sector was the success of California’s referendum (11/16) for the introduction of recreational marijuana. The success was not certain, as the victory happened with a slim margin, but the opening up of the largest US State to recreational cannabis was a major milestone and resulted in the first real stock market rally for the sector. Later Bill C45, also known as the “cannabis act”, was introduced in the House. Seeing that the Canadian government was interested in pursuing legalization, Constellation Brands, a major beverage company, made an investment on Canopy, which resulted again in a rally for the whole sector, which peaked with the start of sales in California. After the final reading and the passing of bill C45, Constellation made a much larger investment in Canopy making the stock prices rally all the way until the start of sales in Canada. We will analyze in more detail the Constellation Deal in the following sections. Characterized by a USD 9.7bn size, the legal cannabis market is expected to hit USD 32bn by 2022, recording a 34.6% CAGR in the broader time frame 2018 – 2023. This impressive expected growth is owed to the imminent legalization processes that are taking place all throughout the world, in the next few years, both in terms of medical and of recreational use. In fact right now, only Canada, Uruguay and 10 federal US States allow the latter. Different countries and States within the US regulate and tax the market differently, sometimes with the objective of discouraging consumption, resulting in harsher laws, sometimes with a focus on stamping out the black market, resulting in better conditions for firms. Where marijuana has been legalized recreationally without significant impairments, sales of alcohol have diminished by up to 15% as the new product disrupted traditional consumer goods, but with noticeable side effects. Following is a table comparing retail prices in countries/US States which have legalized recreational marijuana for more than 1 year and those which have only legalized medical marijuana sales. As can be noticed a significant drop in prices occurs where recreational marijuana is allowed, as the supply catches up with the demand. If retail prices are getting lower, worse can be said about wholesale prices in the US, with lows of 1,3$ per gram in Washington, as evidenced by the table below. While it can be argued that the lack of trade of marijuana between States (which is illegal) is resulting in oversupply cases, the general trend for prices is to lower over time as both efficiency and output increase. As profit margins become lower in the future value-added products such as drinks, edibles and pharmaceuticals derived from marijuana are expected to become the main drivers in the profitability of the biggest companies in the industry, as profits from simple cultivation drop. Finally control over branding and retailing may be another way to increase margins. In particular, branding is often banned or restricted while retailing can be either done privately or by the State. As wholesale prices drop significantly faster than retail prices private, retailing may be critical to increase margins in the medium run. In Canada, the main focus of this article, retailing is done both by the state and privately depending on the province. Ontario, which hosts 40% of the Canadian population will start private retailing only in April 2019. The big 3 are the 3 most important publicly traded marijuana companies based in Canada. 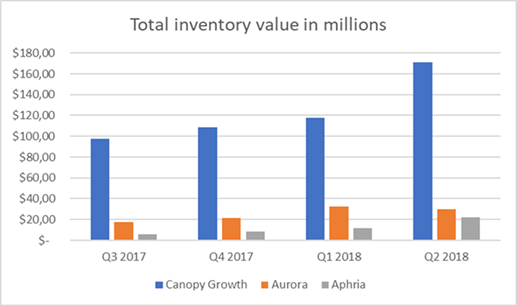 Those are: Canopy Growth, Aurora Cannabis and Aphria. Venture capital: Investment in media and start-ups related to cannabis. Following is a more in-depth analysis of the “big 3”. Founded in 2014 by Chuck Rifici and Bruce Linton Canopy Growth Corp is Listed on the TSX (2016) and on NYSE (2018). Canopy’s stock closed at C$51,49 and thus its market cap is set at C$11,95 billion. The firm has reported 77,9mil C$ in revenue, an increase by 95% over the previous year. The largest marijuana producing company among the “big 3” by far, as evidenced by the graph below, Canopy Growth is considered by many the dominant firm in the industry. The main strength of Canopy lays in its partnership with Constellation Brands. Constellation Brands, a 39.8 bn $ market cap company (05/11/2018), is currently the only beverage company to have invested in the Marijuana industry. The company has invested on Canopy on two different rounds. The first one, a few months after bill C45 was proposed, at a price of 12.98 CAD with an investment of 245mil USD, acquiring an ownership of 9.9% and valuing the company at 2.5 billion. The second one, done in August 2018, after the passing of the final reading in the Senate, consisted in a much larger investment of 4 billion USD at a price of 48.60, which, after the exercise of the additional warrants which were issued during the first round, resulted in an ownership of 38%. In addition, a new round of warrants (with a 3 Y expiry) was issued in this second fundraise, which give the right for constellation to reach more than 50% of the ownership of Canopy by infusing at least an additional 3.5 bn USD in cash. The deal still has some critics. Premiums paid were very high: Not only is Canopy (as well as the rest of the sector) trading at very high multiples, but the premium paid on the closing price of 32 CAD (27/08/18) was 52%. While the idea of developing marijuana-based beverages, the main objective of the deal, aligns with what we analyzed should be the long-term strategy for companies in the Marijuana business, one can wonder if Constellation was better off developing its own beverages organically, seeing how pricey the sector overall is right now. An additional problem consists in Canopy’s healthcare and biotech divisions, which would lack synergies with the consumer goods business of Constellation. In any case the investments made by constellation were the main reason for the many rally’s which occurred in the stock prices of the sector, as increases in Canopy’s stock, as discussed in the first section of our article, were immediately followed by the competitors. Listed on the Toronto and the New York Stock Exchange, with a CAD 8.98 bn market cap (as at November 9th, 2018), Aurora Cannabis Inc. is the second-largest cannabis producer in the world. Its reported 55mil CAD in sales in the last year. Funded in Edmonton (Canada) in 2013, Aurora has been committed to delivering the best and safest medical cannabis, compliant to the highest quality standards, but at reasonable prices. The corporation at issue can today count on a network of six main fully operational facilities all throughout North America and Europe. Anyway, Aurora’s characteristic is not to be found in its operational framework. Indeed, the company owes its success to the aggressive M&A practices it has been undertaking ever since it was born, which has allowed it to enter all the businesses typically performed by the other companies in the sector as well as expand its international reach. Its main two main acquisitions, that is MedReleaf and Cannimed Therapeutics Inc., were both carried out in the current year (2018). The first deal, with a size of CAD 3.2bn, was clearly aimed at combining the two best players in the cannabis production, so to enhance growth and increase scale, ahead of the imminent legalization wave, which sooner or later will hit economies all throughout the world. Thanks to Aurora’s automated greenhouse and MedReleaf’s high-yield cultivation techniques, the new entity will enhance productivity and abate costs, so to flood the market with 570,000 kg high-quality cannabis per year. In addition, both the companies have a strong R&D department, strengthening the synergies. This all-stock deal is characterized by an exchange ratio of 3.575 Aurora’s shares per unit of MedReleaf’s ownership, embedding a price of CAD 29.44 per MedReleaf share, and a consequent 34% premium (based on a 20-day volume-weighted average prices of Aurora and MedReleaf’s common shares on TSX, as of May 11th, 2018, when the deal took place). The other main M&A transaction is the CAD 1bn hostile takeover of Cannimed Therapeutics Inc., again with the objective of increasing scale. Despite attempts by management of the target to deploy “poison pills” and other takeover defense provisions, the board ultimately accepted, enticed by an incredible 184% premium offered over the closing price of November 4th 2017. The transaction was characterized by a mixture of cash and equity exchange. Specifically, 1.2 million Cannimed’s shares were sold for 3.4 million Aurora’s shares, plus CAD 1.7m cash. The deal was the first billion dollar one in the marijuana industry and enabled Aurora to expand significantly, at the cost of significantly diluting ownership for the shareholders. Less than one year from its foundation, Aphria was granted the license to produce and sell medical cannabis by Health Canada, the Canadian government department with responsibility for public health. In 2015, the company started its first wholesale shipments and between 2016 and 2017 it established partnerships with Tokyo Smoke, a lifestyle brand, and with Shoppers Drug Mart, a Canadian pharmacy that sells Aphria’s products online. Also, a strategy devoted at expanding the business in the US was announced. After completing the acquisition of Broken Coast Cannabis, a cannabis producer based in the Vancouver Island, in January 2018 Aphria agreed to purchase Nuuvera, an Ontario-based marijuana company, for a total consideration of $826m. This last deal was controversial, since several Aphria’s insiders held undisclosed stakes in Nuuvera at the time of the acquisition; consequently, at the closing, the price paid was only $425m due to a reduction in the cash offer and the lower value of Aphria’s shares. Today, Aphria is the smallest of the “big three” cannabis companies and focuses its production on capsules, oral solutions and vaporizers. As evidenced by Figure 1, among its competitors, the company is the lowest cost producer. 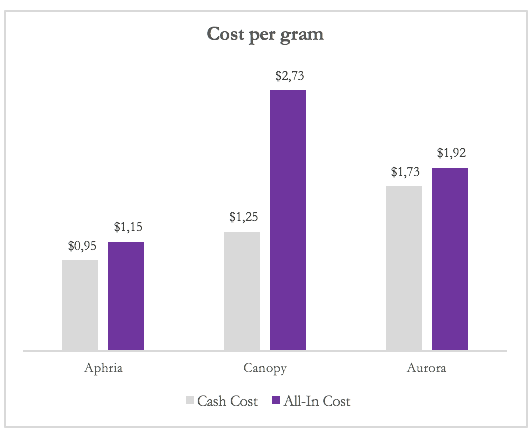 Looking at both the Cash Cost per gram of cannabis, that excludes packaging, shipping and fulfilment costs, and the All-In Cost, it is clear that Aphria is able to produce at a very low cost, compared with its closest peers. Such a competitive advantage is mainly due to the fact that the company grows its plant by using only natural lighting, whereas the most established industry practise is reliant on artificial lighting. In FY2018, the firm reported C$36,92 millions in revenues with an 80,6% increase compared with the previous fiscal year. The Tilray Case: Is It a Bubble? Critics have said that the sector right now is in a bubble, as irrational exuberance has brought extremely high valuation. An example can be made with Tilray. Tilray is a Canadian cannabis producer based in the Vancouver Island town of Nanaimo. The company is listed on the Nasdaq and currently trades at around $107 per share. Tilray was established in 2013 under the umbrella of Privateer Holdings, a Private Equity firm backed by Peter Thiel, the famous and controversial Silicon Valley venture capitalist, which still holds most of Tilray’s shares. With activities in more than 10 countries, the company is a global supplier of medical cannabis and its product portfolio currently includes both extracts and dried flowers. In December 2016, Tilray became the first marijuana producer in North America to be GMP certified; also, it recently secured an agreement with the Drug Enforcement Administration (DEA) that allowed its products to be shipped to the United States for medical research and clinical trials. Although the company is not yet profitable, last year it reported $20m in revenues and it is expected to increase them up to $41m at the end of the current year. On the 19th July 2018, Tilray went public on Wall Street at an initial share price of $17, thus becoming the first marijuana company to be listed on the Nasdaq. Following the IPO, Tilray’s shares showed an extremely unpredictable and volatile trend, which is the reason why the stock received extensive coverage by media and market watchers. As shown by Figure 2, after just one month of trading, in August 2018, Tilray’s stock had around doubled its value to $35. Moreover, between the end of August and September, the shares followed an upward trend and then skyrocketed to the $300 intraday peak reached on the 19th September, exactly two months after the Initial Public Offering. Such a huge increase in value implied that Tilray’s market capitalization was worth more than $20m, even more than how much the market valued American Airlines and Expedia. Thanks to those movements, the international financial community raised the question of whether Tilray is overvalued or there is room for additional growth in value. Specifically, the topic was extended to the whole cannabis stock market which is deemed to be in a bubble. Immediately after reaching the peak, Tilray’s stock experienced a correction which brought down its value slightly above $100. However, in mid-October the shares traded well above $150, meaning that overvaluation may had not stopped. In recent days, Tilray’s value has declined around 40%, finding some kind of stability around the $100 range, and the company currently has a market capitalization of almost $9bn, much higher than the values assigned to both Aurora Cannabis and Canopy Growth. Also, looking at some relevant multiples shown in Figure 3, Tilray still seems to over-valued, at least when compared with its industry peers. Source: Yahoo Finance (Data for Canopy Growth must be adjusted for the investment from Constellation: multiples constantly changing). The question remains open: will Tilray’s fundamentals prevails, thus making its share price drop, or will legalization in a greater number of jurisdiction and the cannabis momentum lead to a renewed rally in the stock price? Will the expiry of the Ipo lockup in january of privateer holdings, which holds most of the shares, “crash” the stock? But, more in general: is there a bubble in the marijuana industry? Certainly, the upcoming earnings and guidance which is going to be given in just a few days from today will prove the first real test for not only Tilray’s, but the whole sector’s fundamental strength.